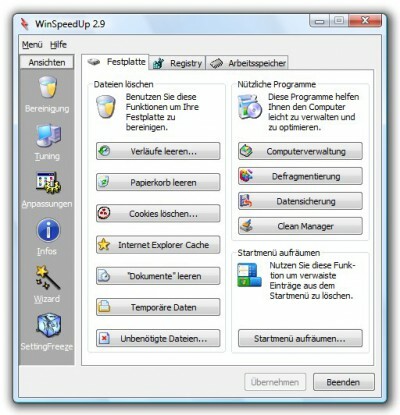 With WinSpeedUp you get access to hidden sytem options with which you can accelerate and improve Windows. Programs are started faster, the harddrive is cleaned up and the sytem start gets shortened and you can get further information about your computer. You can deal with settings which the original Windows surface merely reveals by a long way round. With WinSpeedUp you adjust Windows to your needs and accelerate your internet connection. Slow Internet connection speeds can be frustrating, and the hardware upgrades necessary to speed your system up can get very expensive. Systerac XP Tools present ten valuable tools that help you tweak your windows xp for optimum performance. Do you often download and install software from the Internet and uninstall it after a while? Many uninstall programs, however, can't completely remove everything from your computer as you believe - information written into the registry by the application may still remain there - by and by your registry file will be larger and larger, your system will be slower and slower, or even run into malfunctions. XPepius is a tools suite for tweaking, optimizing, tuning and cleaning of Windows XP. HS WinPerfect is a useful windows system optimizer that cleans hard-disk and system registry, optimizes memory, tunes-up system specific settings, accelerates internet connection, improves cpu usage, manages security and backup issues and uninstalls software no longer wanted. PC Accelerate increase priority foreground window and optimize memory status Each working program has its priority.